System Maintenance - Online and mobile banking services will be unavailable on Tuesday, 4/23, from 8:30 - 11:00 p.m. HST. Start and end times are estimates. We apologize for any inconvenience. Achieve what is most important to you with our personal loan that has competitive rates and flexible terms. At HawaiiUSA, what matters to you, matters to us. We're here to help turn your biggest financial dreams into a reality. Join the Life matters movement and open an account with us today. Celebrate financial wellness in April! Explore HawaiiUSA's complimentary tools and tips for managing your money. The wait is finally over! Star Wars: Galaxy’s Edge is coming to the Disneyland Resort starting May 31, 2019. 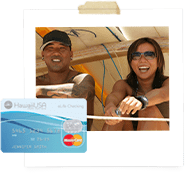 Set your dreams in motion with MyFi, a free personal finance manager for HawaiiUSA Online and Mobile Banking users. Managing your cash flow is the best way to build strong credit. Learn how.